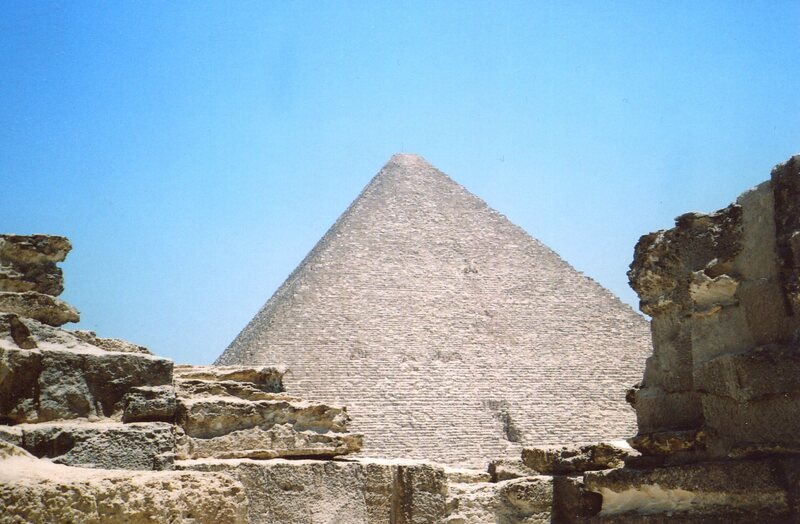 By selecting Giza as the site of the Great Pyramid, King Khufu set one of the greatest stages in world history. We saw the stage in yesterday’s post. Now we’ll explore the building. 1. The Great Pyramid towers 450 feet over the Giza Plateau. 2. The Great Pyramid was originally encased in limestone, which increased its height to 480 feet. The limestone made the building reflect the sun, and appear like a ray. The sun god, Re, had become central in King Khufu’s dynasty. The builders of Cairo in the Middle Ages quarried the casing to build palaces and mosques. 3. The pyramid rises at a 52 degree angle. 4. The last pyramid that had been build, the Red Pyramid, rises to 345 feet at a 43 degree angle. Khufu’s Great Pyramid perfected the form that his father, Sneferu, created. 5. Khufu’s builders learned from the mistakes Sneferu’s workers made while constructing the Bent Pyramid at Dahshur. 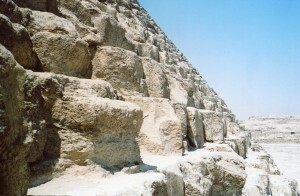 They had a more stable foundation at Giza, and used larger blocks, which they placed more closely. The Great Pyramid contains about 2,300,000 stone blocks, which weigh an average of 2.5 tons, around the bottom at the edges. The foundation and the size and more accurate placements of the stones made the Great Pyramid stable enough to sustain the 52 degree angle. 6. The pyramid might have been built by erecting a straight ramp that approached the building from one side. Or a ramp might have wound around the pyramid as it was built. Mud spread on the ramp would have made pulling the stones easier. I’d still rather work in an office. The enormous amount of labor ensured that Khufu would survive into the Afterlife, and continue to keep the state in order. Ancient accounts say that up to 100,000 people built the Great Pyramid, and that they worked for 3 month periods between the growing seasons. Most thus might not have been permanent slaves, but ancient writings portrayed Khufu as a cruel despot. Did all those men with aching muscles and sweaty brows have faith that they were toiling for the cosmic order, or were they cursing under their breath? In the next post, we’ll examine the interior of Khufu’s eternal trophe home. Donald Trump, eat your heart out (but remember that you can’t hide it from Osiris’ scale in the Afterlife).